Detouring north to visit Victoria Falls was a non-negotiable element on my recent South Africa trip. Mosi-oa-Tunya (“the smoke that thunders”) is the world’s largest waterfall, one of the 7 Natural Wonders of the World, and a UNESCO Heritage site. To go halfway across the world and NOT visit would be something I’d regret forever. The problem was – how do I get there and where do I stay? Fortunately and surprisingly, internal South African Airways flights made it relatively easy to incorporate this trip into my itinerary. I didn’t expect it, having flown on their 15-hour non-stop from JFK earlier in the week. That plane was old, the seats were uncomfortable, and the flight attendants were more interested in each other than the passengers. I assumed I’d be stuffed into oversold rust buckets or, perhaps, simply stranded at the airport. But my flights from Cape Town to Jo’burg to Victoria Falls in Zimbabwe were on time and included friendly service…with meals! Perhaps I’d actually traveled back in time a couple of decades. My base of operations in Zimbabwe was the Victoria Falls Safari Club, a subset of the larger Victoria Falls Safari Lodge. Rates begin at $240 per person, per night. Club rooms are twice as large as the lodge rooms, feature king-sized beds draped with mosquito netting, and private balconies overlooking the bushveld at the edge of the Zambezi National Park. The open bathroom has a large shower and separate soaking tub. Additional club amenities include a complimentary mini bar, full breakfast, afternoon tea and sandwiches, and a sundowner cocktail hour. It’s entirely possible to pass up dinner. But don’t. 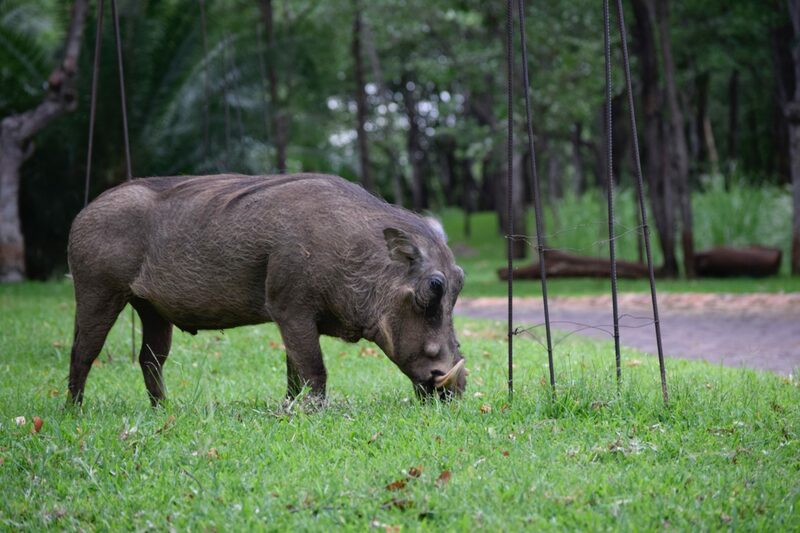 The Safari Lodge resort property includes an open air restaurant experience called The Boma – Place of Eating. Guests are greeted by dancers who ask you to don a traditional fabric sash tied across one shoulder. Tables ring a large rotisserie grill and buffet with a generous selection of hot and cold items, including local specialties like warthog steak and crocodile tail. The truly adventurous are invited to down a mopane worm, similar to a caterpillar. I debated whether to chew or swallow, just like “Survivor” contestants during the food challenges on early seasons. I was rewarded with an “I Ate the Mopane Worm” certificate for my effort. 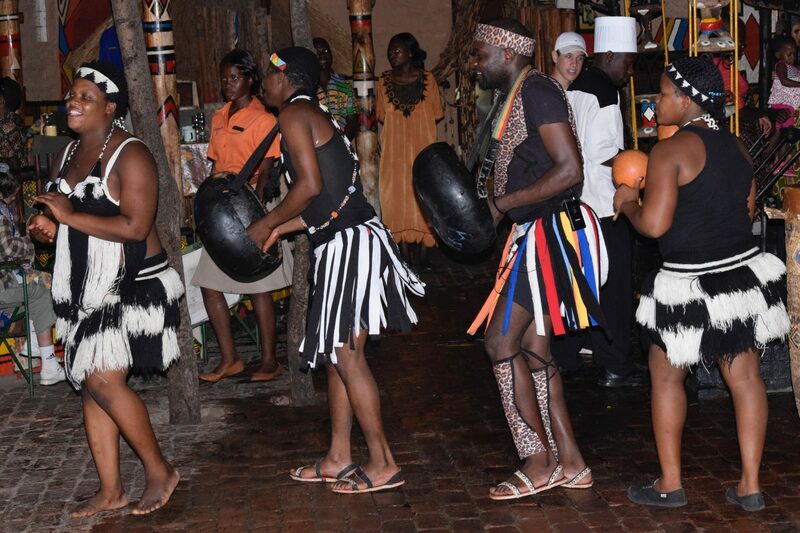 Dinner includes an energetic dance performance and a lesson in tribal drumming. Trust me. There is nothing funnier than watching a group of overstuffed Brits pounding away on ngomas. I assume I looked ridiculous too. The Safari Lodge property has two additional restaurants and a small pool that overlook a large watering hole where animals gather throughout the day. A pleasant way to pass the afternoon is with a cocktail and binoculars. And, at 1 p.m., guests are escorted into a blind constructed in the bushveld. 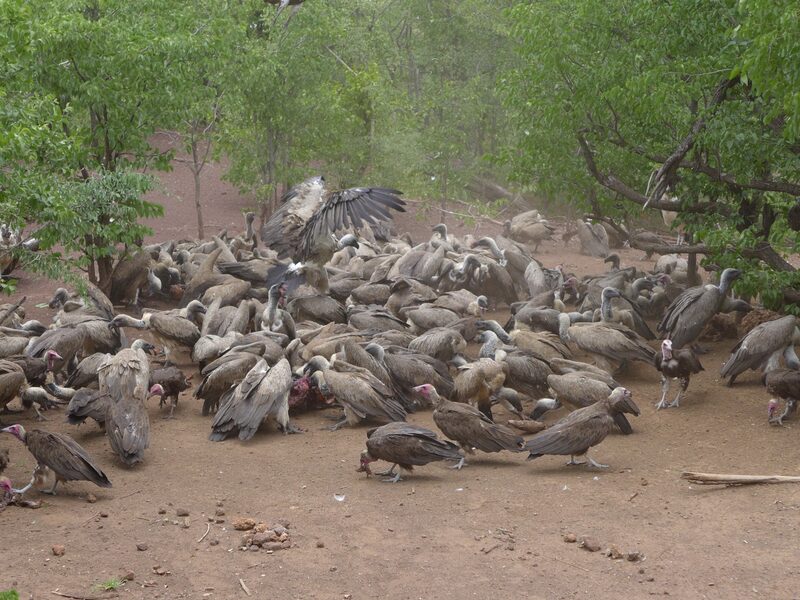 Remains from the Boma are scattered on the ground and then a frenzied flock of vultures attack the meat and bones. The lodge sponsors the “Vulture Culture” program to bring awareness to the plight of this endangered species. Throughout Africa, animal carcasses are often poisoned by farmers to control predators like hyenas and wild dogs. But the vultures are then poisoned as well, and a crucial link in the circle of life is broken. Because the vultures pick animal bones clean, they eliminate the source of diseases like anthrax, so the decline in their population is a tremendous concern. During your stay, you can arrange a variety of activities with the assistance of the friendly and helpful staff at the Victoria Falls Safari Lodge. These include game drives, bush walks, and a number of extreme sports like whitewater rafting and bungee jumping. Perhaps the most terrifying is a swim in the Devil’s Pool. During the dry season, guests are escorted to a pool formed by the rocks at the lip of one of the cataracts so you can look right over the edge, 345 feet straight down. I passed on that one but definitely recommend a walking tour. 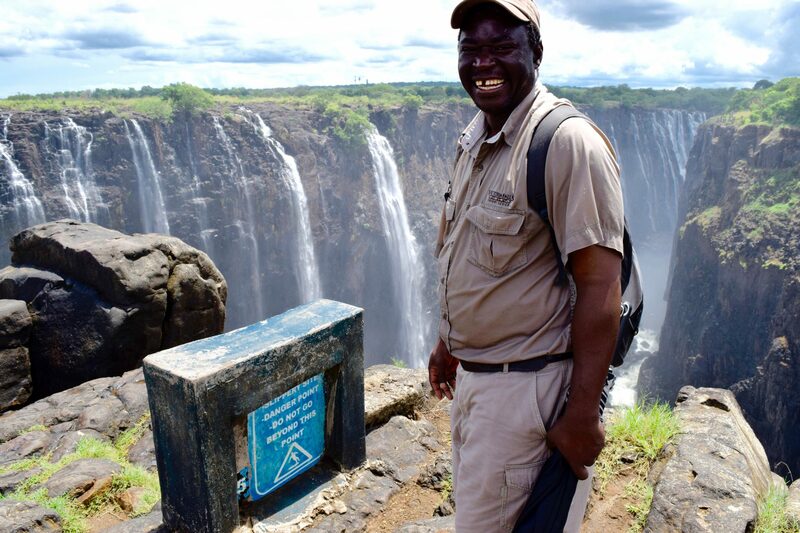 Zimbabwe has strict licensing requirements that include at least 3 years of training, so the park guides are professional with extensive knowledge about the Falls and the flora and fauna of the region. 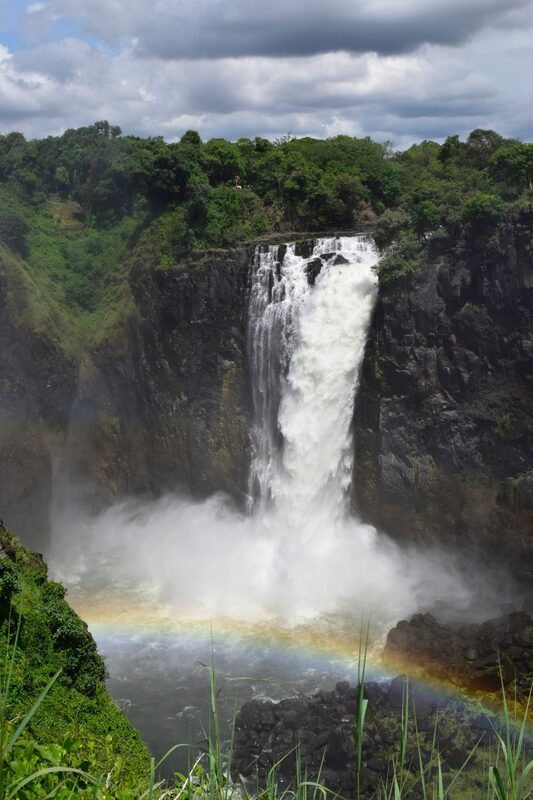 In 1855 David Livingstone, the first European to view Victoria Falls, wrote that “…scenes so lovely must have been gazed upon by angels in their flight.” I truly felt like a character in a fantasy picture book; there were strange horned animals, beautiful, but deadly, plants and magical rainbows. The wrong hotel would have made it feel like someone had torn out a few pages. Fortunately, the Victoria Falls Safari Club was the right place for this angel to rest at night.